Our shop 1800GunsAndAmmo was proud to be a major sponsor of this year’s Mansfield Cares Ball recently held on February 18, 2017. The Mansfield Cares volunteer organization is a non-profit group that works everyday to assist those in need in the local community. Every year, Mansfield Cares holds their biggest fundraising event, the Mansfield Cares Ball. 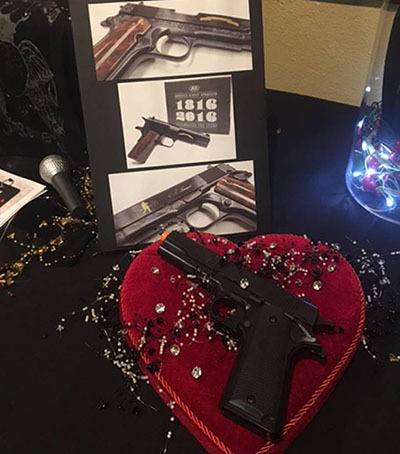 This year marked the 18th annual Ball, and 1800GunsAndAmmo was honored to provide items for the live and silent auction as well as gift bags for all the attendees who donated to the cause. We were also live at the event this year to assist with the auction. This year 1800GunsAndAmmo selected a Limited Edition Remington 1911 R1 Pistol for the live auction. This classic 1911 pistol design released in 2016 commemorates the 200th anniversary of the Remington Arms Company. All of them were bid on and taken home by attendees to this year’s ball. Mansfield Cares works with several organizations to benefit people in need around the Mansfield, TX area. Their biggest partner programs include the Caring Place Clinic that provides free medical, dental and vision care to people in need and the Harvesting International Ministries Caring Center Food Bank that helps feed those in need. Other organizations include the Mansfield ISD Scholarship Program helping high school seniors attend college, the Common Ground Network that helps provide school supplies for students, the Helping Hands program that provides assistance with rent, food and medical care for families in need, the Payless Shoe Source that donates shoes to people in need, and the Common Ground Angel Tree Program that also helps families in need with free meals and food vouchers.